Coastal communities face numerous challenges as a result of climate change and, more specifically, sea level rise. Regardless of possible reductions in future greenhouse gas (GHG) emissions, the planet is already ‘locked in’ to some climate changes. Projected impacts for coastal communities include increased storminess and storm surge, higher sea levels, more erosion of coastlines, impacts on infrastructure, loss of beaches and coastal ecosystems, soil salinization, and groundwater pooling. The Province of British Columbia advises municipalities to plan for at least one metre of sea level rise by the year 2100. In collaboration with Simon Fraser University’s Adaptation to Climate Change Team (ACT), Ideaspace, and West Coast Environmental Law, the City of Surrey in British Columbia hosted a series of three community meetings in the summer of 2016 in the Crescent Beach community to talk about the challenges they face from a changing climate and consider how to adapt to be ready for the future. These meetings provided insightful and positive results as community members shared a desire to protect their community and collaborate to find solutions. This report* documents these results and shows how the Crescent Beach community is responding to climate change. *Download the full text from the right-hand column. Summaries of the methods and key outcomes are provided below. In 2013, Surrey developed a Climate Adaptation Strategy that includes a proactive approach to protecting its coastline. As part of this plan, the City is developing a Coastal Flood Adaptation Strategy (CFAS) to prepare for sea level rise and storm surge. Recognizing that adaptive measures may significantly alter coastal communities, the City is engaging local residents and stakeholders in developing the strategy to build a shared understanding of potential impacts and explore options for adapting to climate change. As a first step, the City invited Crescent Beach residents to attend a series of meetings between May and September in 2016. The City, together with West Coast Environmental Law, Simon Fraser University’s Adaptation to Climate Change Team (ACT), and community engagement firm Ideaspace, designed and led a series of interactive workshops—called charrettes—to engage Crescent Beach community members and investigate possible responses to future coastal flooding risks. A charrette is an intensive, interactive planning process in which stakeholders collaborate with designers and other experts to create a shared vision for a project. It allows stakeholders to learn more about the issue at hand, and gives those designing responses the opportunity to receive feedback from stakeholders. Since charrettes allow for all participants to co-author the outcome of the session in a non-hierarchical fashion, this concept was determined to be the ideal approach for the first steps in exploring sea level rise with Crescent Beach residents. The first charrette introduced the community to the impacts of climate change and sea level rise around the world and in Crescent Beach. Charrette 2 was a full-day event designed to generate community dialogue about the challenges of, and possible responses to, sea level rise and related flooding in Crescent Beach. The final meeting focused on sharing and confirming the outcomes from Charrettes 1 and 2 with the community. Details of activities undertaken during each charrette are provided in the full text. Crescent Beach residents are strongly connected to both the natural environment and to their community. Local businesses and amenities are key parts of the community. Many residents have lived in Crescent Beach for decades. They see it as a beautiful and unique place, are attached to their homes and want to see the community thrive well into the future. The potential responses created by community members can now provide the City with important context specific to Crescent Beach and its residents as the City proceeds to develop the Coastal Flood Adaptation Strategy. Connections to nature were reflected in a number of the models that focused on softening shoreline areas with vegetation and logs to buffer storm surge, as well as in the choice of most tables to create barrier islands with natural features. Preserving community connections and concern for local businesses meant that residents supported solutions that protected the community as a whole, and were not just concerned with whether their own homes would be directly impacted by flooding. Finally, participants were looking for responses that could be adapted over time, and possibly implemented in phases, not just short-term solutions. While there is extensive technical analysis and further consultation to be done, the City of Surrey now has guidance directly from the community about the types of responses that are likely to align with their values and priorities. The Crescent Beach community meetings were an important element of the broader consultation that will take place over the next three years with stakeholders and Surrey residents. The goal of the CFAS is to help prepare Surrey for a changing climate and support Surrey’s coastal communities to become more resilient. More information on the CFAS process can be found on the City’s website at www.surrey.ca/coastal. From page 22 of the summary report: Community model of adaptation response 4 - building offshore features. For the Crescent Beach charrette process, the City of Surrey and community members explored four possible responses within the Protect approach to adaptation; these other three responses were upgrading the existing dyke, build a wall and build a soft shore and modified dyke. These responses provided different ideas as jumping-off points for further discussion. 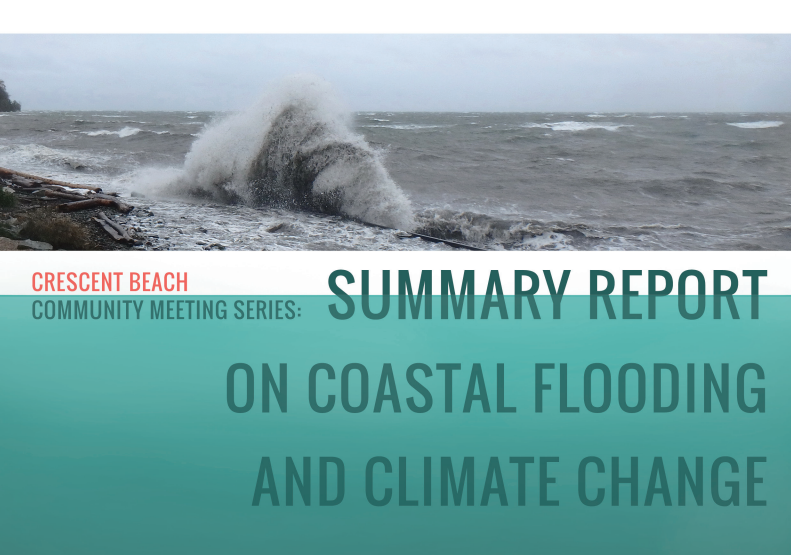 Seiferling, H., Harford, D., Bulley, D. and Carlson, D. (2016) Crescent Beach Community Meeting Series: Summary Report on Coastal Flooding and Climate Change.